What we are in essence is the Sat. the “Truth” or that which “Real”. The Sat that is within us is both universal and individual. It is the source of all our experience, including spiritual experience. The nature of the Sat is silence and stillness. 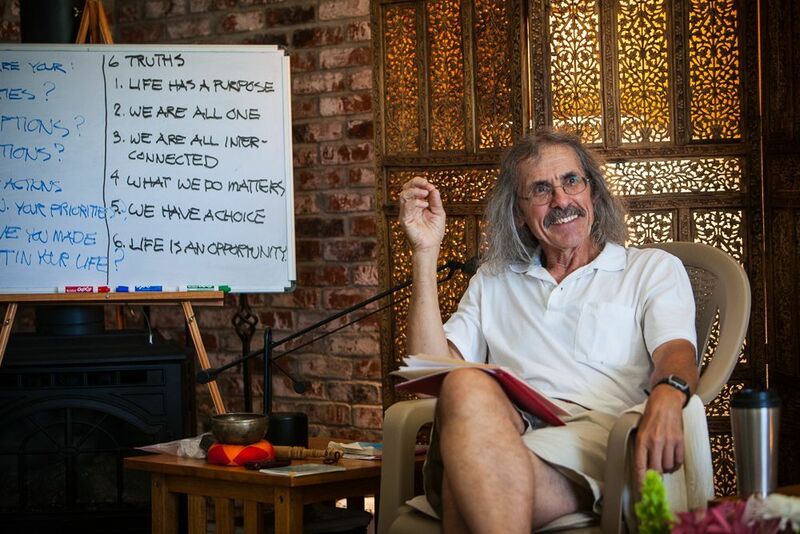 This experience takes the form of ‘sat-chit-ananda’…truth, consciousness and bliss. How can we know the Sat? by being silent and still. A silent retreat is an opportunity to do this. There are two things that happen at such a retreat. One, you step out of your life and habits and two; you spend an extended period of time in silence and stillness with a group doing the same thing, facilitated by a teacher who knows the Sat. In a very real sense there is nothing to “get” out of such a retreat rather you will “lose”, not only some money and time but also those qualities that resist, block and obscures your ability to know your self as the Sat. It is a process of subtraction, of loosing that which prevents our natural condition of Truth from being known and experienced in our day to day life. The ego is what prevents us from knowing the Sat. It puts up blocks, obstacles and distractions that prevent us from bringing our spiritual nature into our lives more fully. But the ego is just a habit. It keeps repeating the same thoughts, feelings and actions that support it and avoids all those that don’t. Breaking this habit is the purpose of any spiritual process and this is the purpose of the retreat. By attended the retreat you take actions that weaken the ego’s hold on you and your life. This gives our inner most being a chance to come forward and reclaim its rightful place on the throne of our lives. Breaking the habit of the ego requires that we sometimes step out of our outer, busy life and enter into the field of Truth that silence and stillness creates. It is like a small death. The outcome is a renewed life, a new birth. Having a deeper connection with Truth changes how you view and interact with the world. You can become more able to respond appropriately rather than react to what happens. You become more aware of your ego’s agenda and less attached to it. You may become more aware of other people’s agenda’s/ego. You become more detached and your witnessing self becomes stronger. The retreat will be in a lovely, natural, quiet mountainous setting on a beautiful lake which will encourage your feeling of silent yoga or unity. Every aspect of it is being organized not only to manifest the Sat but also to give you time to explore how you can bring what you discover into your life. This is the intention and the purpose of this retreat.